Mrs. Meyer’s Clean Day biodegradable laundry detergent features hard-working yet gentle cleaning agents, while also providing a special, singular scent for your entire home. Geraniums, so bold & cheery to see, and clearly quite rosy to smell. An easy and elegant protector of any front porch. So nice to have on hand! Effective yet gentle on clothes, our concentrated laundry soap really packs a punch when it comes to removing dirt and grime. Contains surfactants from plant-derived sources, dirt and stain-fighting enzymes, other thoughtfully chosen ingredients and, of course, those important essential oils. This liquid detergent is HE compatible. Concentrated for 64 loads of laundry. Also available in other garden inspired scents and products such as body lotions, liquid hand soaps, candles, and so much more! Mrs. Meyer’s – rooted in goodness. 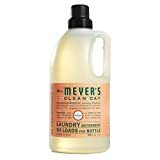 Interested in the Mrs. Meyer’s Clean Day Laundry Detergent, Geranium Scent, 64 ounce bottle (Pack of 2)? Is the price too high? You can easily price watch this product and we'll notify you when the price reaches your target.